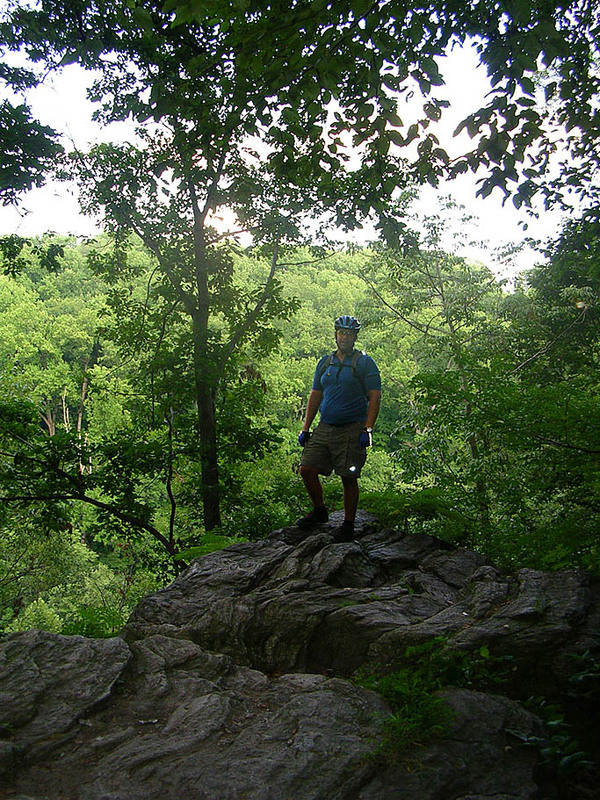 I spent a few days in Philadelphia on business in August of 2008 and with the help of some great folks at my new job, I was able to get in an after-work ride at Wissahickon. This is an "in-town" ride that is pretty awesome. 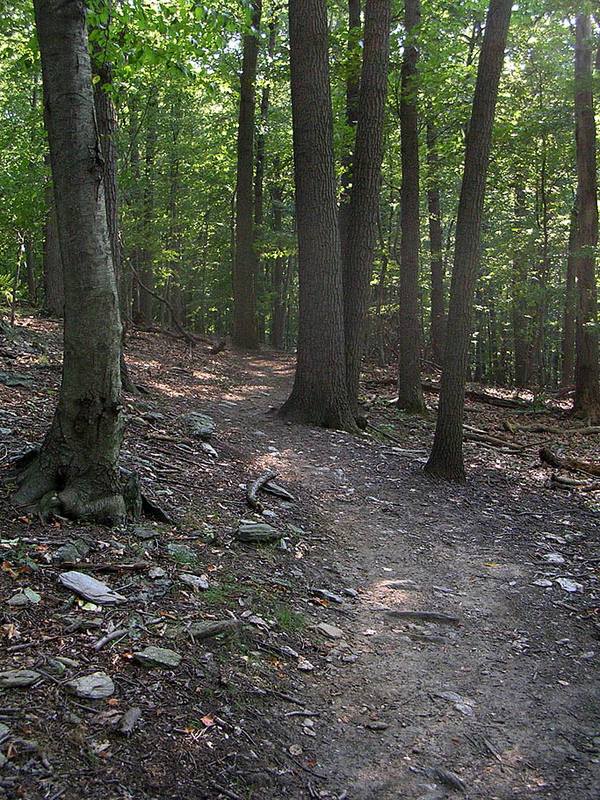 Wissahickon will really tweak your definition of "in-town" as once you hit the trails you feel like you have just dropped off the city map and escaped into much more remote countryside. While we probably did well less than half the park we rode some really sweet flowy singletrack with technical rock and root sections as well occasional log rides and built-up features. 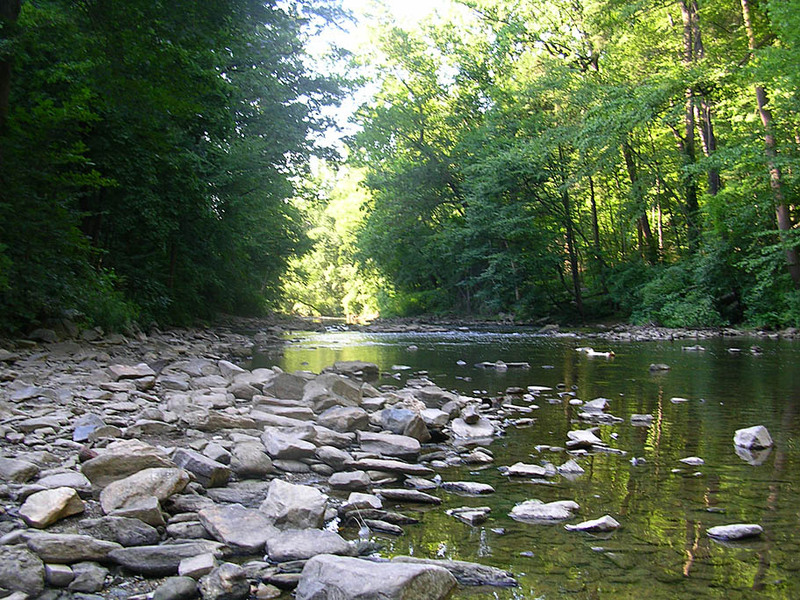 Combined with the wonderful scenery of towering hardwoods, lush green undergrowth and the tranquil Wissahickon Creek just about everyone should score some major readings on their fun-o-meter. 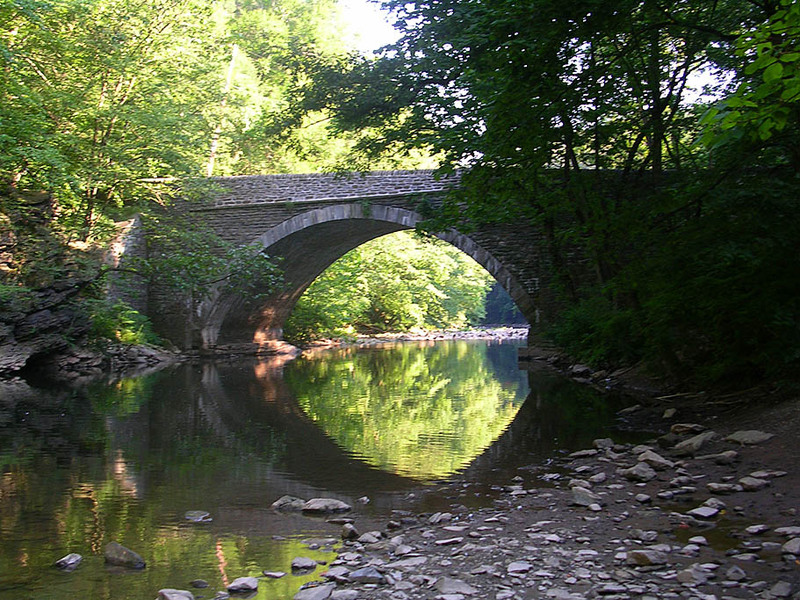 Wissahickon Park encompasses about 1,800 acres along the Wissahickon Creek watershed and is fully within the city limits of Philadelphia. 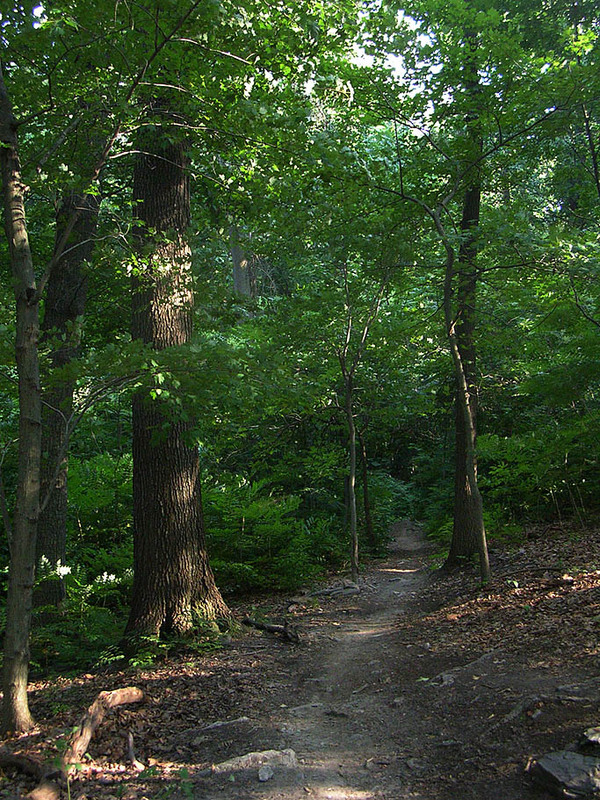 The park is just a portion of the much larger 9,200 acre Fairmount Park system. Fairmount Park which was founded in 1855 when a large private estate (Lemon Hill) was dedicated as a public park and renamed Fairmount Park. 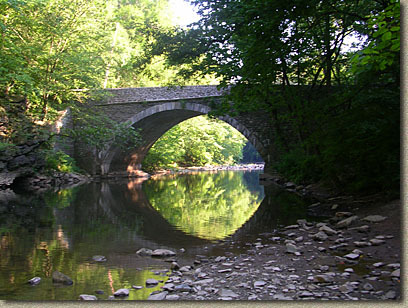 Wissahickon was brought into the Fairmount Park system in 1868. 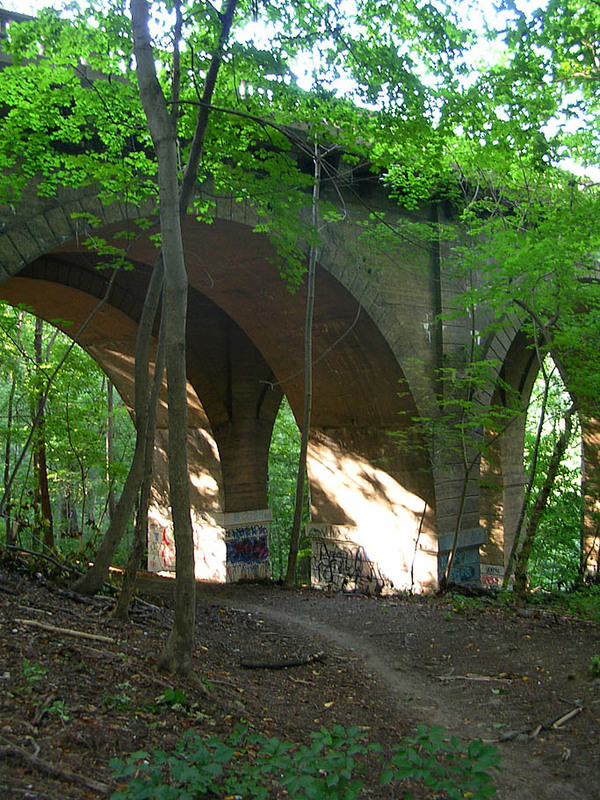 If you would like to get to learn more about the history of Fairmount Park and the Wissahickon Valley check out the Friends of Wissahickon website as well as the citie's Fairmount Park Website. For an even more encompassing history lesson check out the digital copy of the 1922 book published by the Garden Club of Philadelphia "The Wissahickon" provided by Villanova University. Okay enough history. 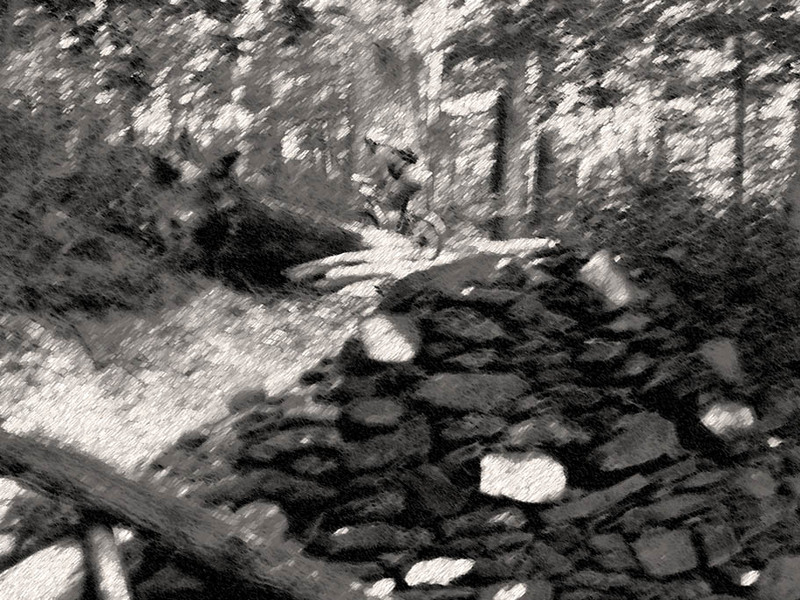 Hands-down, you can not go wrong with the Philadelphia Mountain Biking Association's website. They have a bunch of information on the area as well as a map of the Wissahickon trail system. (I have a copy of the map here, but you should check them for an updated version). 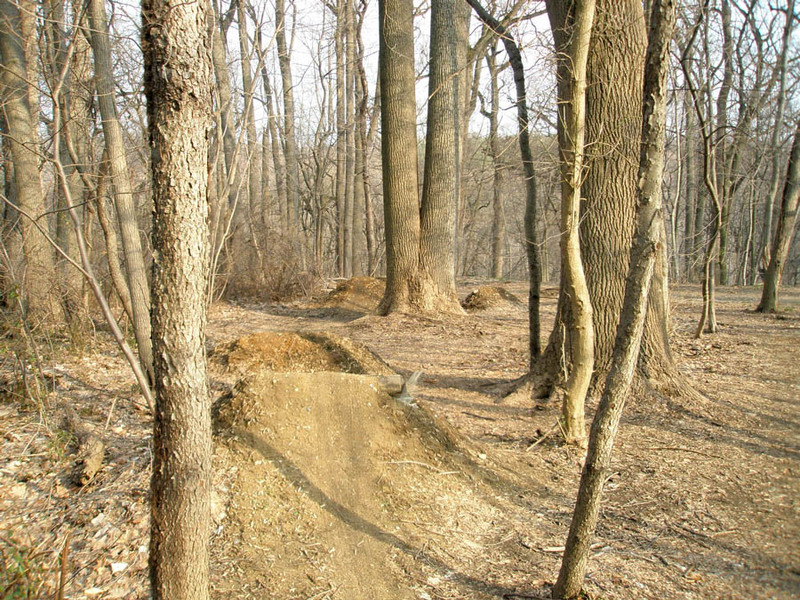 The site also has information on reoccurring rides from the numerous assess points to the trail system. Bike Rentals: I was lucky enough to get hooked up with bike. If you are looking to rent, here is a page. You will need to call around as not all of them seem to have up to date published information. While I had done some research on Wissahickon prior to heading out for this trip and interesting coincidence occurred. A few days before my flight, the most recent copy of Mountain Bike magazine arrived at my door. I knew I would have some time to kill on the plane, so without even pulling off the plastic, I tossed the issue into my laptop bag. 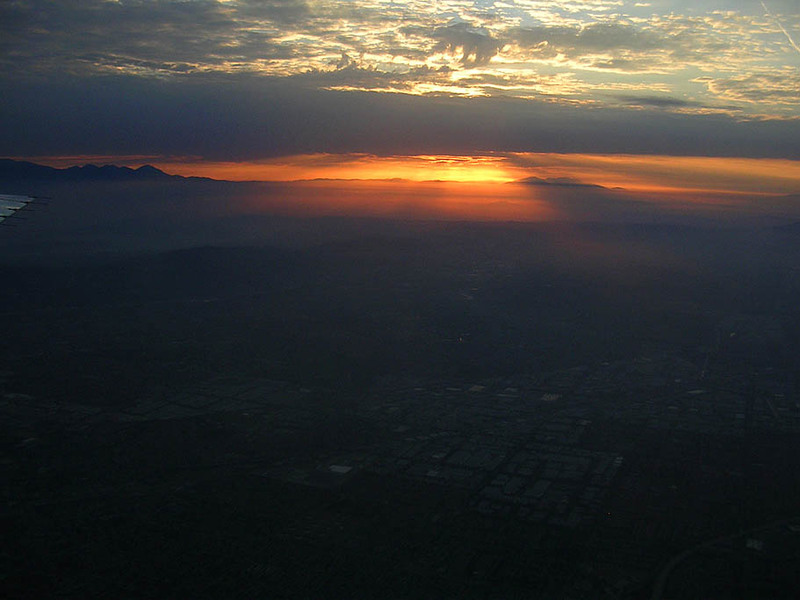 My trip started with a sunrise early commuter flight from Carlsbad to LA. 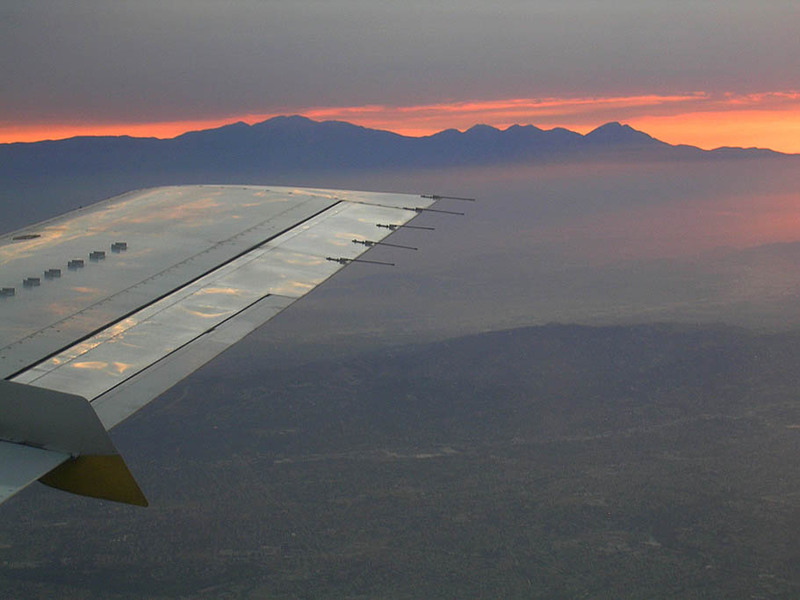 It was a cool flight as I spent a good portion of the sub-hour flight picking out places I had ridden 10,000 feet below me in the early morning light. I also started thumbing through the magazine and low and behold on page 24 there was a short article featuring the Philly's Wissahickon trail system. That settled it, too much of a coincidence for me not ride this trail system. The guys in Philly already knew I was a MTB addict, so it did not take long during the first day of meeting the team for the topic of mountain biking to come up. Plans were brewed and before long a bike was lined up and someone was going to show me around. My original plan was to chase down a rental bike, but it was super cool for one of the guys to hook me up. Come Wednesday at the end of the workday, we were off for a ride. 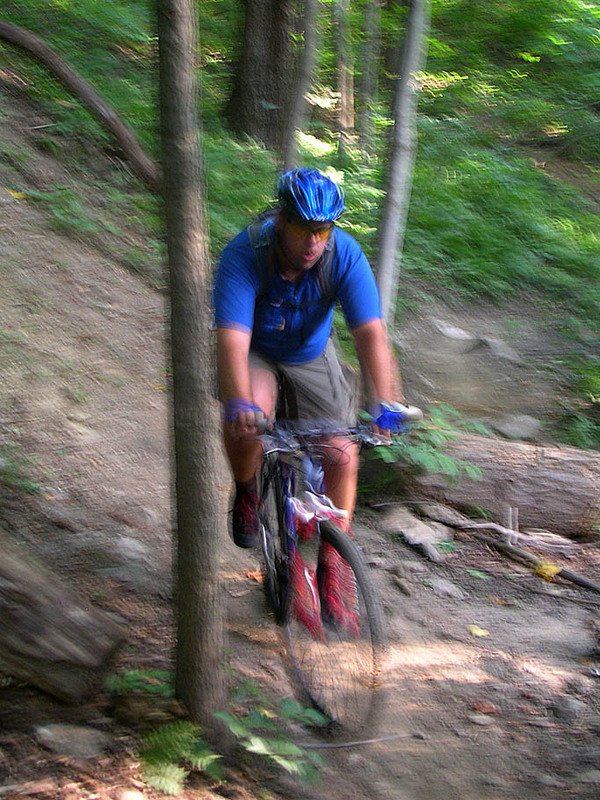 Man the singletrack was really killer. For the most part pretty buff but interspersed with roots and small rocky sections. All around were towering hardwoods that created a wonderful shaded canopy. Being the summertime is was a little warm and included the typical east coast humidity. Most of the trails we were on had gentle slopes that undulated along the fingers and draws leading down to Wissahickon Creek. 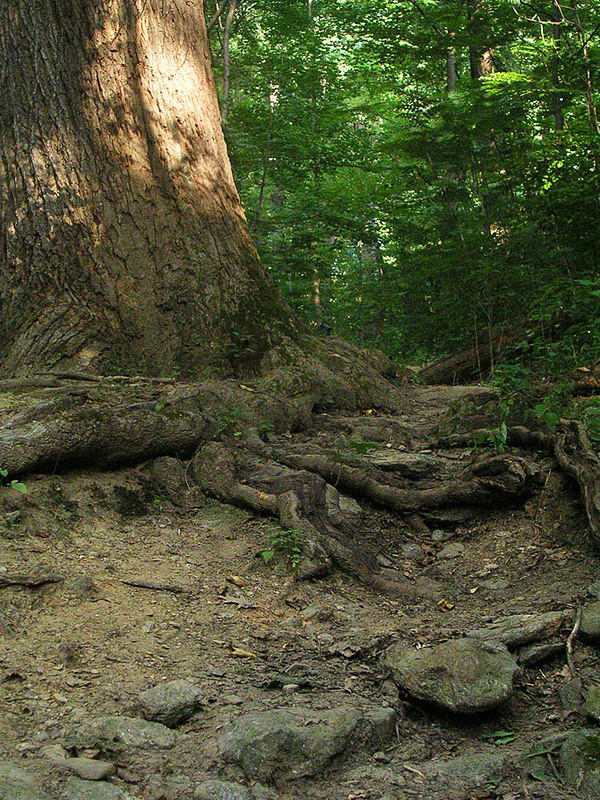 There were however some climbs that were quite technical and rocky with some roots thrown it for good measure.. It had rained the night before and I was expecting muck and mire. There was nothing of the sort here. The trail soil had enough moisture to make a nearly perfect balance of speed and traction. I was digging it. One thing I was bummed about was my decision to leave my regular DSLR camera at home in favor for a small point-and-shoot camera. There were lots of shots that I simply could not get with the P&S camera. There was never much concern about being lost. The entire park is bordered by streets to the east and west and the creek goes down the middle. Basically any prolonged climbing takes you away from the creek and towards a street. Just from our single afternoon there, I can you tell there are lot of nuances of the park to learn. We went through numerous trail junctions and basically picked any option that would allow us to stay high on the ridge. You could really add some suffering to a ride out here if you were to take every up and down route you came across instead of staying high or low. 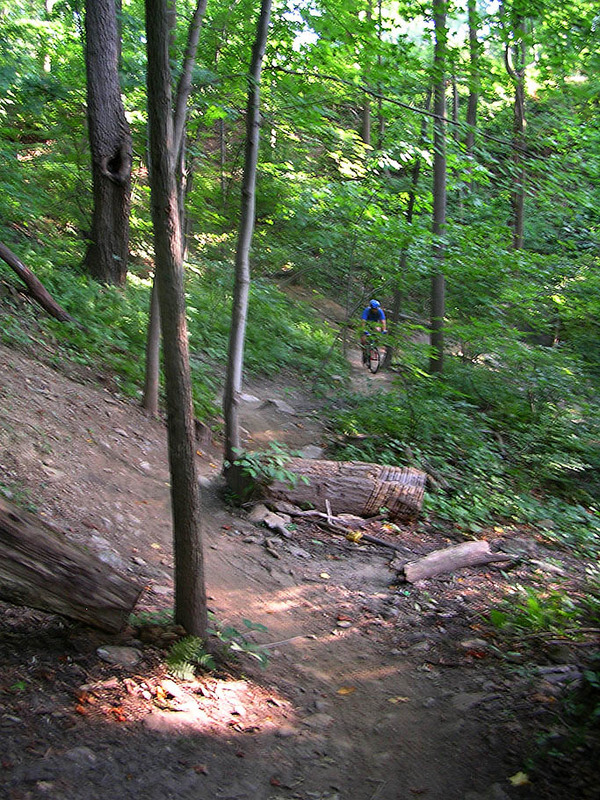 The trails up higher on the ridge had some great sections of just ripping singletrack. 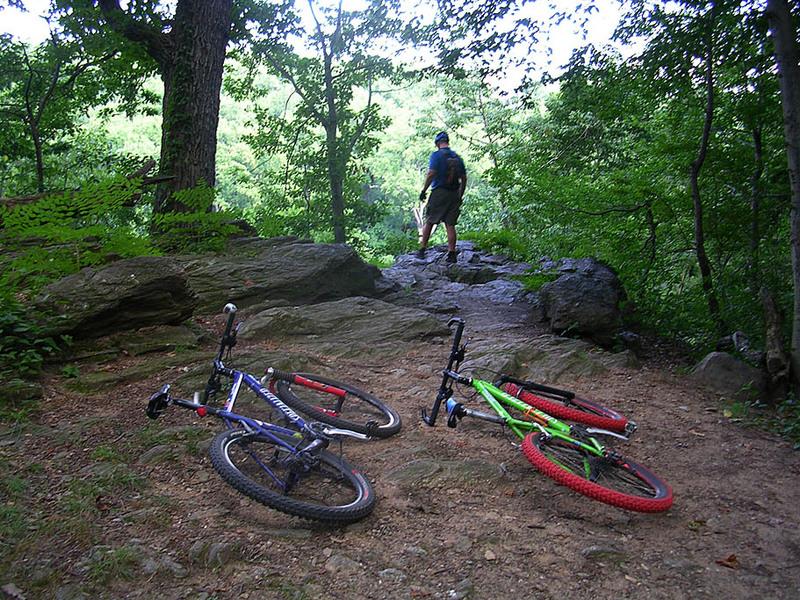 Wissahickon is not just a trail system that bikers get to use. 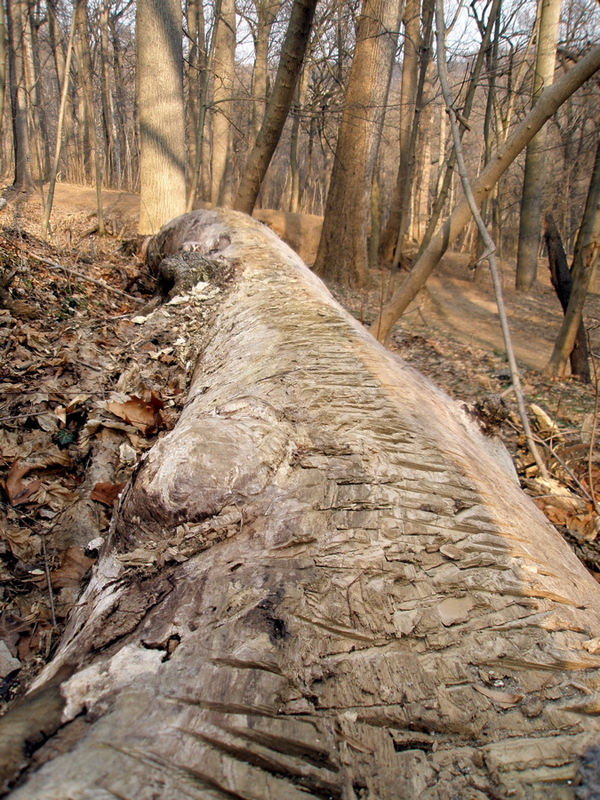 It is extremely obvious that mountain bikers are involved with the trail maintenance and development here. 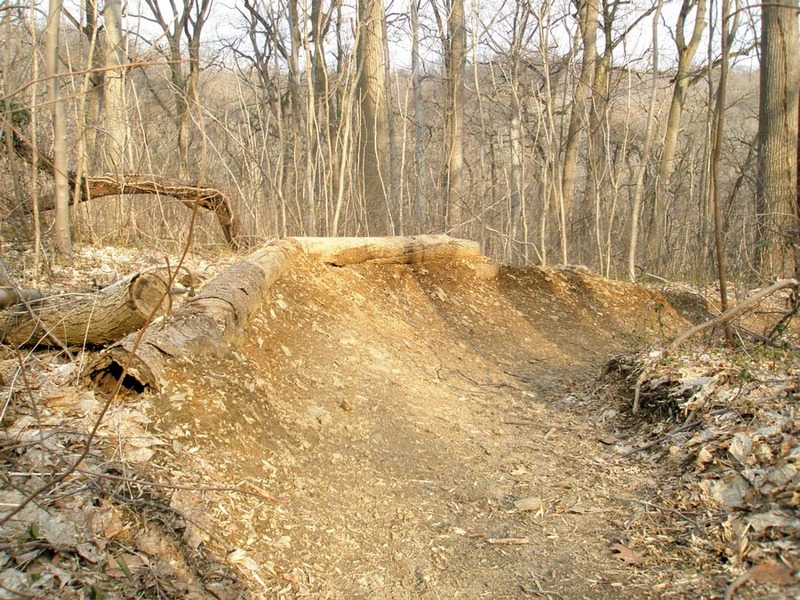 There are some nice features built into trails as optional lines that include table tops, log rides and rolls as well a jump or two. I was pretty impressed with how well they blended these features into the trails and forest. Thanks to Chris Hunter for providing the photos near the bowl area from earlier in the year. It was not long after the bowl that we took a pretty technical trail down to the creek and Forbidden Drive. This is a wide gravel non-motorized thoroughfare where you will see everything from people walking their dogs to folks on commuter fixes heading home. Forbidden Drive used to be the Wissahickon Turnpike but has long since be closed to vehicular traffic. What is really awesome is that it is tree-lined, shaded and does not have much in the way of a "drive" feel. We ventured over to the the other side of the creek and followed some trails back up the other side of the creek and valley until we made our way back to Valley Green Road and crossed back over the the other side to finish off the ride. After the ride we hit up a local place for some tasty brews and food while watching a bit of Phillies baseball. 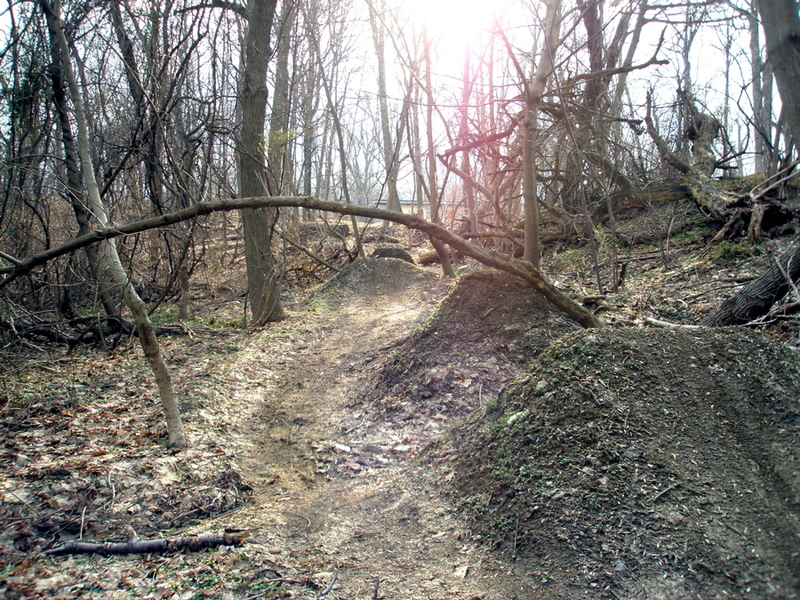 The Wissahickon trails were extremely cool and real change up from what I have been riding out west. A real treat! A special thanks is owed to JD Vaites for playing tour guide. It would also have not been much of a ride without the help of Bill Long who let me borrow his bike. I'm looking forward to returning the favor when they find their way out to the "West-Side".